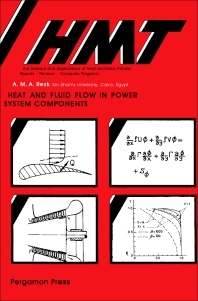 Heat and Fluid Flow in Power System Components is a collection of papers presented at the Second Conference on Mechanical Power Engineering held in Cairo, Egypt in September 1978. This volume covers a wide range of topics relating to heat and fluid flow in power system components, including film cooling, droplet evaporation, and laminar flames. Practical applications such as furnaces, heat exchanges, pumps, and turbines are also discussed. Results of investigations carried out experimentally, by computation, and both computation and experimentation techniques are presented. This book is comprised of 21 chapters and begins with an analysis of heat transfer in power elements, including evaporation of surface liquid droplet in an air stream. The thermal conductivity of granular materials is also examined. The following chapters explore reactive and non-reactive flows, paying particular attention to helium two-phase instabilities; air flow around hyperbolic cooling towers; pulsating flow in axial turbines; laminar flame propagation in tubes; and characteristics of combustion heat liberated downstream of circular bluff bodies. The final chapter is devoted to an experimental and theoretical investigation of the reversed flow furnace. This monograph will be of interest to chemical and mechanical engineers as well as researchers concerned with the design, development, and optimum modes of operations of power systems and their components.